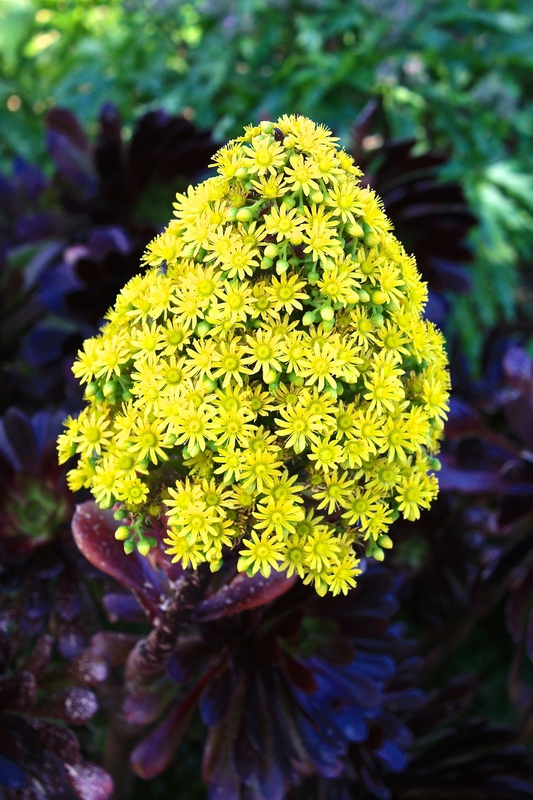 Succulent plants are not everyone’s cup of tea, but one which attracted a lot of admiring glances when we opened our garden for the National Gardens Scheme was Aeonium arboreum ‘Zwartkop’. It’s hardly surprising given its height (hence arboreum, meaning ‘tree-like’) and the colour of the fleshy leaves, which are quite unlike the average houseleek. The glossy, purple-black rosettes which top each stem lend the plant its common name ‘black rose’, rather nicer than the direct translation of ‘Zwartkop’, which is ‘black head’. Anyone who’s made a trip to West Cornwall or The Isles of Scilly will recognise Aeonium ‘Zwartkop’ from the mild coastal gardens in this part of the UK. 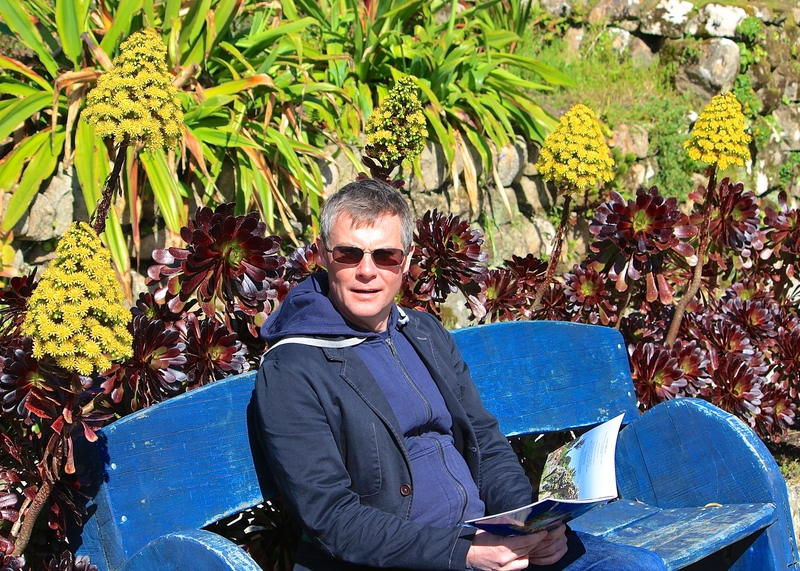 When we visited the island of Tresco in April, the sub-tropical Abbey Gardens were full of mature, well-branched plants topped with chunky panicles of bright yellow flowers. These appear only in the most favoured locations; those with the greatest similarity to the Aeonium’s native Canary Islands and North Africa. Hardiness is an issue elsewhere in the country, so even in balmy Broadstairs I keep my plants indoors when there is any chance of frost. Despite its tenderness, A. ‘Zwartkop’ is happiest outdoors in a sunny, well drained spot. Even if overwintered indoors it can be bedded out during the summer. At The Salutation aeoniums are used as a striking accent plant in Lutyen’s white garden. 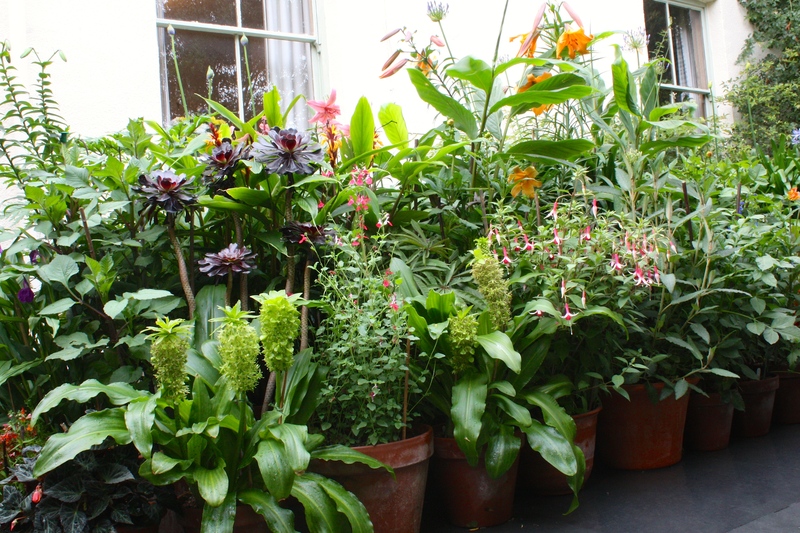 I keep my plants in pots and use them to punctuate a mass of dahlias, lilies and gingers by the front door. If grown indoors A. ‘Zwartkop’ needs the brightest spot you can offer, and even then the leaves will rarely be as richly coloured as they are outside. Keep a close eye out for tiny green caterpillars which can destroy the centre of the rosette in late autumn. Happily A. ‘Zwartkop’ is extremely easy to look after, needing very little water in winter (perhaps a drop every fortnight) and a weekly drink in summer. Aeoniums like dry air, so are quite happy in a centrally heated room. Propagation is equally straightforward. Leaf rosettes with a few inches of stem can be cut cleanly away from the plant with a knife and the cut surface left for a week or two in order to callus over before potting into in a gritty, well-drained compost. The drying stage is essential to avoid rot setting in and to encourage rooting from the sides of the stem. Within a month or two the new plant will be growing away strongly whilst the old one produces a number of new rosettes, helping to create a well-branched bush. 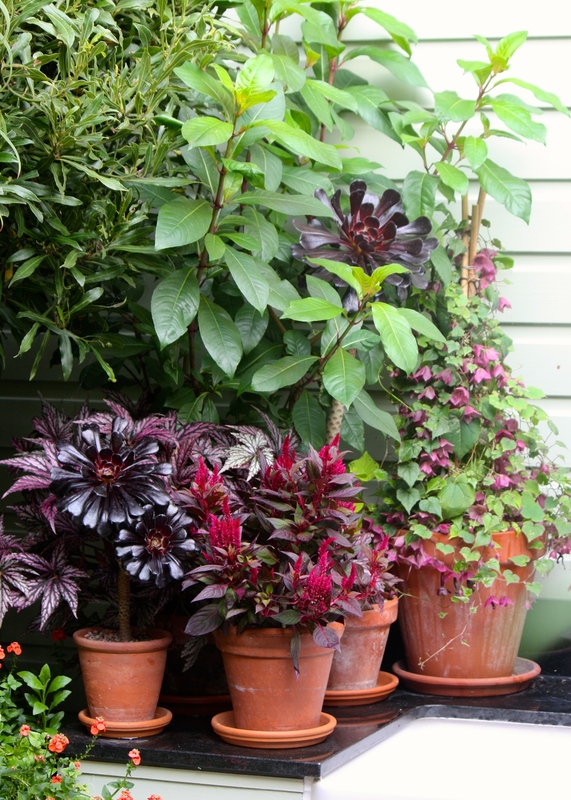 This process can be carried out several times, meaning lots of spare plants to give to your envious friends. If you are selfish like me, plants can be allowed to grow tall and lofty, perfect for making a statement in the garden. For Aeonium arboreum ‘Zwartkop’ and a great selection of other choice, named aeonium varieties, visit Trewidden Nursery’s website. Thanks so much for this post – I am now enlightened! I saw these ‘Zwartkop’ at Oxford Botanical Gardens in June and was fascinated by them, but I did not know their name. Love your blog and the beautiful photos. Thanks so much Tanya! Do give the Aeonium a go if you can find one, it will be perfectly happy on a sunny windowsill as well as outdoors in summer. Interesting, looks a bit like a black sempervivum on a stem 🙂 …until it flowers! My biggest plant must be six and it’s never flowered. I am not sure what triggers flowering, but suspect it’s maturity and a good hot summer. Fingers crossed for us both next year. I must do likewise. I am bit chicken about chopping up my largest plant, even though it’s incredibly top-heavy. I’ve never had a problem growing these in central coastal california, but mine have never flowered, altho others in this vicinity do. I have them in various locations, full sun, morning sun, afternoon sun. Makes no difference. I seldom water them and they are otherwise very healthy. Can you advise? 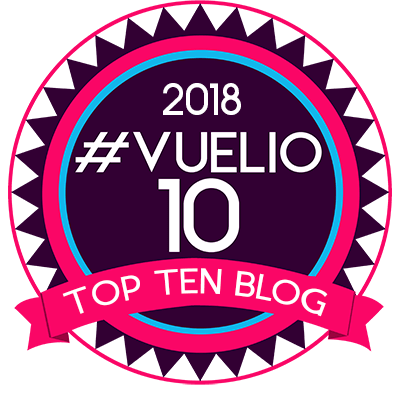 Hi there, love your blog, mine however is a question – that’s if you don’t mind! I have beautiful aeoniums but they are now beginning to get “chunks” bitten out of them! Have you any idea what could be causing this and if so how can I treat them. Love them and hate seeing them being attacked like this. Thank you. Extremely helpful tips – many thanks. Getting the torch out ready for tonight!! !